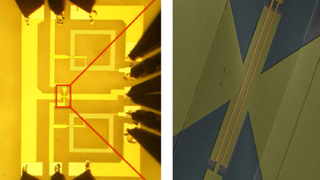 IBM researchers have created the first graphene-based integrated circuit constructed on a wafer of silicon, in a setup that's smaller than a grain of salt. The circuit is a broadband frequency mixer, which can operate up to a decent 10GHz. It's yet another advancement in the use of graphene—which, in case you forgot, is that fantastic, ultra-thin "wonder material" that won two scientists the Nobel prize for physics. Graphene is only one layer of (carbon) atoms thick—but despite its ultra-lightness, it's still nearly indestructible. Like, 200x stronger than steel and the strongest substance in the known universe kind of indestructible. But it's also flexible and its conductivity is 100x greater than silicon. So it's badass. Graphene Just Won Two Guys the Nobel. So What the Hell Is It? Pretty soon, we could be seeing applications of graphene in high-bandwidth communication and low-cost smart phone and TV displays. But before now, researchers hadn't been able to make graphene adhere to other metals and oxides. IBM's researchers overcame this. They applied wafer-scale fabrication procedures that maintained its quality while letting it integrate with other components.